From my first vinyasa class fourteen years ago, I knew yoga was for me for the rest of my life. Did I practice and teach yoga in another life? I especially enjoy introducing yoga to those who think they are too stiff, or sore, or injured or old. Not true! Come try a class with me! I am grateful to share my enthusiasm and expertise in each class that I am fortunate to teach. I especially love the moment when class finishes and everyone experiences the deep peace, satisfaction and enjoyment of the yoga experience. What can I offer and share? Only the best of what has been given to me. 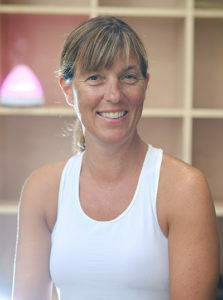 After 15 years of experience Andrea believes every yoga class helps you achieve better posture and physical alignment. Practice also fosters a positive focus and attitude. You can change your body and mind in an hour! You’ll be more comfortable and full of energy and lightness. This gets to be a habit that you can practice anywhere, in class or in the grocery line. My classes consist of a strong, steady flow with an emphasis on connecting to, and moving with your breath. My goal is to create a space where you can slow down, connect with your body, creating a sense of wellbeing and inner peace that you can take with you when you leave class. Outside of the studio I am the mom of three girls and three rescue dogs, so you’ll often find me watching kid’s sporting events or walking in the woods. I believe the relationship we have with ourselves is the most important relationship we will ever have. My yoga classes are designed for you to meet yourself on the mat, from the surface of your skin to the depths of your being. When we are able to sustain evenness of mind while confronting inner limitations and outer challenges, our full physical and mental potential begins to develop and we are able to observe the benefits in our everyday experience. My yoga approach plays with deep holding, exploring the purpose of poses, while blending flow and fluidity so you eventually tune in to your natural rhythm of being. My classes end with deep meditation in a body ready to let go into now. I am pursuing the remainder of my 500/300 hour yoga instructor certification at Kriplu Center for Yoga and Health. Margaux began her journey with yoga when she was 17 years old. She was drawn to the practice because of the physical mindfulness and connectivity the movements on the mat inspired in her body. Having always been a physical person, the practice challenged Margaux to explore her own limits and develop a more meaningful, healthy relationship with her body. Yoga has continued to give to Margaux as time has passed; time on the mat refreshes and grounds her. Her practice also balances her spiritually. In the summer of 2015, Margaux was certified as a 200 Hour Registered Yoga Teacher from Forever Om Yoga of Lake Forest, Illinois. Through teaching, she hopes to invoke in her students growth in their physical, mental and emotional understanding, strength and acceptance. Margaux’s teaching balances a rigorous practice of vinyasa flow with an intentional meditative aspect. Her classes are challenging and rewarding. compassionate approach to teaching. After practicing yoga for several years, Madi decided to take the next step and became a yoga instructor (RYT-200) training through Open Doors Yoga Studios in 2011. Since then, she has taught classes ranging from one person to over one hundred. She has experience teaching all levels, from first-time yogis to seasoned practitioners, and offers plenty of modifications so that her class is accessible to any and every one. A large emphasis is placed on the breath (pranayama) and moving with the breath (vinyasa). Her class is a slow-paced vinyasa flow that will be physically challenging but mentally relaxing. By the end of class, students should feel like they worked hard, but should also feel more peaceful and calm, with a deeper self-awareness and a fresh perspective on life. I was drawn to yoga 20 years ago to improve my mental and physical health. The yoga mat was the perfect refuge for me to find the patience and centeredness I was seeking to navigate single motherhood and a very busy lifestyle. In 2016, I took my 200 YTT to find my voice as a teacher and completed my 500 YTT in 2018. As a lifelong learner, I am on a quest to share how a healthy combination of yoga and endurance sports can help free the mind. In my class, I focus on opening and expanding my students’ hearts, bodies and minds. My teaching helps to both strengthen the muscles and release any tension you may have allowing your body to find its way back to center. You will leave the class feeling like you have created more space, more energy and possibly feel a little “yoga drunk” (just ask me what this means the next time you see me in the studio). In some of my classes I play an eclectic mix of music which is integrated into my vinyasa flow sequences. I also try to bring lightness and humor to my classes. Outside of the studio, I am a mom, athlete and leader of a social media marketing and wellness business. I look forward to meeting you on the mat – let’s get centered. We all have ideas and thoughts about who we think we are or who we want to be as a person, but how do we get there? Right? For me yoga was a vehicle I never considered until one day someone suggested I give it a try. That was eleven years ago this March. I began practicing for the physical health benefits only to come full circle and realize it has brought balance and harmony into my life. What I practiced on the mat carried over into all aspects of my life off the mat. Yoga not only benefitted my health but also changed how I thought about myself and what I could do. It helped my see that I had the power to change my life in the simplest of ways that later lead to bigger and more positive changes. Yoga is the awareness that brings balance into life. After receiving my 200RYT certification from Radiant Core Yoga School in Hendersonville Tennessee, I began my 300 RYT certification with Ashville Yoga Center in North Carolina. I will be finishing in June 2018. 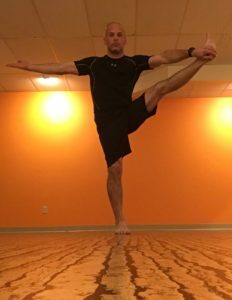 I have taught yoga for four and a half years at My Hot Yoga Place in Hendersonville Tennessee along with instruction for soccer players with United Soccer of Hendersonville. Within those years, I have taught at Foxland Yoga for two years. I was certified and taught with Connected Warriors a program that was for those who were active or retired military service men and women. I had the privilege of instructing for project 21 a program that provides activities and services to the mentally challenged. I have moved back to Vermont after thirty-five years and now will be teaching right here at Hot Yoga Burlington Vermont on Mondays at nine am. My instructional style is anatomy based that teaches alignment according to the individual’s need and body. I emphasize breathing which goes along with vinyasa flow. However, the breath is a telephone wire that links the body and the mind. Once that connection/awareness is made yoga becomes a place that is like home where one can ease into a pose without the stress that we sometimes experience while in practice. Eventually we take this experience into all areas of our life finding balance and peace. Larissa began her yogic journey when she was in college, and yoga has been a constant in her life ever since. 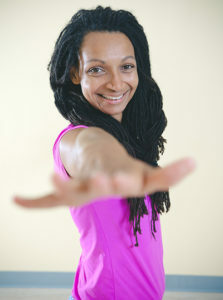 Larissa received her yoga teaching certification in 2012 from Core Power Yoga. She has since taught hot style vinyasa classes in Chicago and Austin, and Flagstaff, AZ. 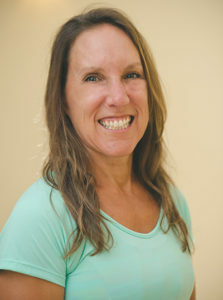 Larissa has always been passionate about teaching to continue her understanding of yoga, and strives to help students deepen their own practices. While keeping classes hot and challenging, Larissa has a knack for making students smile with creative sequencing, and fun transitions. Expect high vibes and to leave feeling refreshed when you take Larissa’s class. Larissa is thrilled to be a part of the Hot Yoga Burlington community. Laura has a serene, centered presence that extends to her teaching style. It’s great for yogis of all levels. She is skilled at queuing for breath, alignment, as well as designing interesting asana sequences. The classes have a soothing quality bringing students an overall sense of wellbeing. She has a soft voice and plays lovely music, making time for silent spaces and stillness as well as postures that build strength, stability and flexibility. Laura often teaches early in the morning, and she always brings a bright and beautiful energy – her classes are a wonderful way to start the day. Joy is an artist who combines the visual arts with the healing arts. 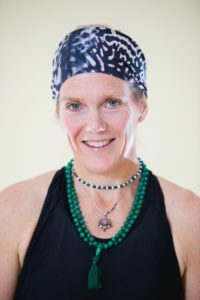 She now owns a thriving body art and face painting business VermontFaceAndBody.com and hand-creates yoga products at her studio HawkfeatherDesigns.com. State licensed and nationally certified in Massage Therapy in 1998. Experienced in development, event planning, grant writing, securing sponsorships and private donor support for various nonprofits. Born in the year of the metal horse, Jess’s personality does not fall short of expectations–fiery, friendly, bold and full of life. She will challenge you to push yourself physically when you can, embrace the emotions that come with asana, and shake your booty in downdog. Challenge her with questions about your own body as she loves the unique differences each body presents. She hopes to expand her knowledge of the body as she is in her 2nd year of the Doctorate of Physical Therapy program at UVM. Her educational goals are to improve her capacity to understand others and their abilities while cultivating self-love. Take away a giftl from her class–maybe it is the undercurrent of self love or the new song you’ll sing to yourself in the car on the way home. Come feel the warmth and take away some sunshine with you!